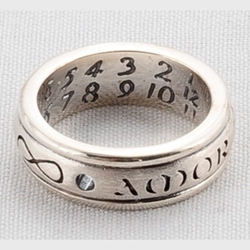 Our Amor Vincet Omnia (Love Conquers All) Ring is the only Promise Ring in the world that doubles as a wearable sundial! Here is how it works: Place the flat side of the ring on a flat surface, on a sunny day. Position the sundial so that the hole faces the sun, a shadow should be cast on the inside. The bead of light that is cast on the numbers of the inner ring indicates the solar time. These sundials are calibrated to read most accurately for 40 degrees north.